As the Kerala SSLC examination results 2015 will be announced today, the students are eagerly waiting to know the status of their yearly preparation. As soon as the state education Minister P. K. Abdu Rabb announces the results today at 4 PM, the results will be published at the official websites of the education department which are being set up to deliver the results on time. With a total of 4,68,495 students appeared for the examination, the results will enable them to apply for higher secondary education. Apart from various websites managed by the Education Department, government call centres, SMS facility and mobile app would facilitate the students to know their results. Students and parents can use the Citizen Call centre to get the results in quick time. Various services including SMS and App will enable the students to know their results. The SSLC results will be available at various websites managed by the education department. For those who wish to know the results through phone can use the Citizen Call centre. Other than knowing individual results, the school wise results can also be checked online by providing the school codes. As each school is being recognized by a unique code, the complete details of students appeared for the exam from a particular school can be known only by providing the code. School codes can be used to get the detailed results of the students who attended the exam in 2015. 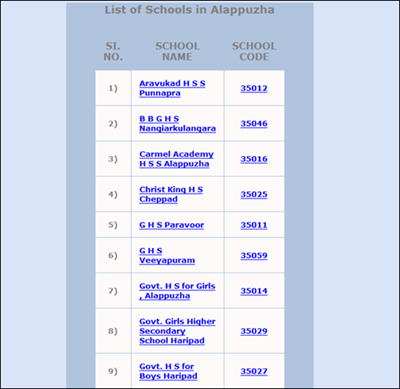 School Codes of various districts like Alappuzha, Ernakulam, Idukki, Kannur, Kasaragod, Kollam, Kottayam, Kozhikode, Malappuram, Palakkad, Pathanamthitta, Thiruvanathapuram, Thrissur and Wayanad along with regional areas are also available at http://sslcapp.kerala.nic.in/.